What to Expect after the Slapping Incident? 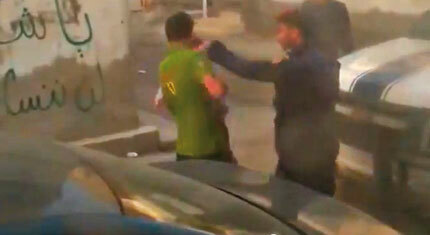 On 23 December 2012, a policeman slapped the citizen Haider Abdulrasool while carrying his son in Aali. A video clip of this spread quickly on You Tube as well as on Arab and foreign TV channels. It was also strongly condemned by local and international media as well as human rights organizations which saw the incident as undermining human dignity and ethically unjustifiable. It is evident that such behaviour is unacceptable and presents a negative picture of the security institution in Bahrain. The incident was a blow to all Bahraini citizens, officials and human dignity. This incident pushed the Government to take action and immediately arrest the policeman who was referred to the military court. This is according to the Ministry of Interior which stressed that such behaviour is not acceptable from a policeman and that it is investigating the incident. The Minister of Interior, Sheikh Rashid bin Abdullah al-Khalifa, stated that the video clip which was broadcasted online and shows violations taking place by a security man is a case which relates to dignity and humanity. It also damages the reputation of other sincere security men and does not reflect the Ministry’s strategy. He also added that the incident portrayed security men negatively and ordered the establishment of a committee headed by the Chief of Public Security in order to limit and address th? violations. The Chief of Public Security, Tariq al-Hassan, stated that everyone agrees that this kind of behaviour is unacceptable and cannot be justified especially from a policeman. This is against the law and condemned by all groups. The victim stated to the press that he recognised the man who slapped him but that there was another man who insulted and assaulted him but is not shown in the clip. He added that he met the Governor of the Central Province, Mubarak al-Fadl who assured him that he would get justice. On another level, the lawyer, Mirvet Janahi, stated that the video is clear and confirms that Haider did nothing provocative and that he is a very peaceful individual; witnesses are not needed to prove this. It should be noted that security officials adopted the police Code of Conduct as instructed by Bassiouni’s report. Several workshops have taken place to train the police force, improve their performance and introduce them to human rights. The incident has proved that such violations do occur and should be dealt with swiftly. Legal procedures should also be taken in order to deter others from committing such violations and prevent a schism between the police and citizens. The procedures that were taken by the Ministry of Interior against the policeman were swift which is positive. This is important as such violations have a negative effect on both the police force and the general security situation- especially as such clips provoke strong emotional reactions from the public. Adhering to the Code of Conduct is very important for Bahrain’s reputation at a time where Government apparatus is trying hard to improve their image and take tangible steps to reform the situation. It is obvious that such behaviour can easily be manipulated during political conflicts and can deepen disunity in the country. We have seen that this incident was used politically by both the Loyalists and the Opposition. It is important to avoid the occurrence of such violations and implement the law vigorousl? so that such cases do not become an additional factor in the political and social division.